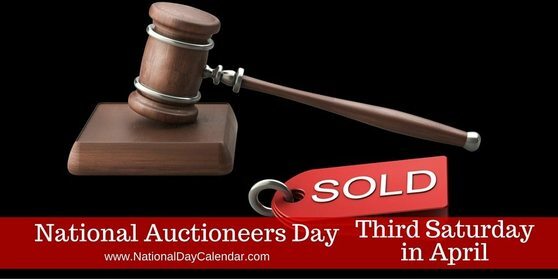 [St. Paul, Minnesota] [April 18, 2015] – The third Saturday in April marks a special day in the lives of auction professionals — "National Auctioneers Day." This special day is recognized by auction professionals as a day to reflect back on one of history’s oldest professions and celebrate the industry’s future. The last bastion of the competitive free enterprise system, the auction method of marketing and the age-old profession of auctioneering continues to grow every year. The most recent research indicated that about a quarter-trillion dollars in goods and services are sold by auction professionals every year in the United States. Online or on the lawn, auctions continue to grow in popularity with consumers. Bidders enjoy the thrill of competition and the rush that comes with the chase for treasures. Auctions are the most fair, transparent and efficient means of selling assets at true market value. Most importantly, consumers understand this and regularly come back to auctions because they are fun and entertaining. The National Auctioneers Association and its members encourage the public to enjoy Saturday, April 18, by attending an auction. To learn more about auctions or to find an auction or auctioneer near you, visit auctioneers.org.